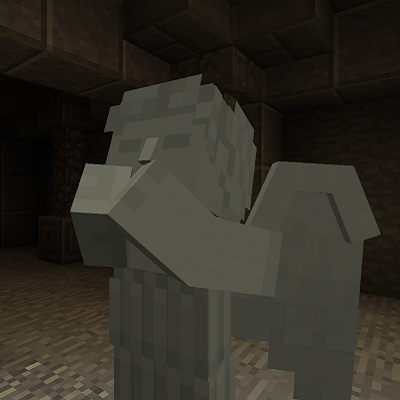 Originally an entry for Modjam 5, the Weeping Angels Mod introduces one of Doctor Who's most fearsome enemies. These quantum locked creatures who cover their faces are one the most feared Doctor Who villains. You surely don't want to get in contact with them! They are fast, faster than you can ever believe. If you're too slow you'll get sent back in time, or have your neck snapped in the blink of an eye. So don't blink; blink and you're dead! The Angels will attempt to distinguish any light source around them. They currently destroy torches and turn off redstone lamps. This can be toggled on and off with the “mobGriefing” gamerule or in config. Hands in the Snow. Angels have a chance of spawning in snow which is indicated with an arm emerging from the ground. Angel Paintings can be crafted that have the chance of spawning a Weeping Angel. When an angel views another angel straight on, they become quantum locked and cannot move, try this when you have no defences on you! Is the mod open source? Can I put this mod in my modpack? You can use this in your modpack, You don’t have to ask for permission as long as you credit the author. You cannot upload my mod on other platforms. This mod is GNU Public licensed v3. More info on this license can be found here. General/distribution/mod packs: You are free to use this mod for personal use. You may use it for non-commercial public use as well, as long as you link back to this thread or the Curse page and use official download links. If you wish to put this mod in a pack that is redistributed commercially, contact me about it and we'll discuss terms. You may NOT redistribute this mod by itself in a way that allows you to earn money off of it. I love your mod. just a question, what is the difference between your version weeping-angels-35.jar and weeping-angels-36.jar please ? I don't see informations. Alright, perfect. Thank you for the info/update. I'm gonna upload the weeping-angels-36.jar right now. Ever since my first angel encounter, the creepy ambiance has not stopped. Can you add a config option to disable it? The creepy ambience. Isn't there supposed to be one playing when there's an angel nearby? Got a suggestion: A config option to determine spawn chance of babies and adults. So if someone wanted only baby versions to spawn, adults only, or a mix of both with a configurable ratio. Thanks for the great mod and all the hard work you guys have put into this. Is there an option to disable teleportation? Also, how do I make them only spawn in their structures? Yes and, I'm not sure what you mean by "their structures"
Nevermind, I think I figured out what I want. Thanks. You should make the a_dizzle Weeping angel move the original mod like it can put its hands down reach out to the player once its close enough or something like that. Angels teleport me very high up in the sky (way above build limit) so I plummet to my death. Is this supposed to happen? Thank you for this mod! Amazing! I have a question about torches being extinguished. I noticed that by placing them on the wall one level up from floor stops them from being blown out. In the config I noticed "# If this is enabled, baby angels will blow out torches". Does it mean baby angels cannot reach to level one above floor? Or it is simply that process of extinguishing torches starts after some time or after some event (like you encounter one grownup angel?) and I did not see it yet? Thank you! That probably means that all vanilla torches will be blown away eventually regardless of their vertical position? So there is no way to use vanilla torches at all? I tried one setup where mining corridor would be 3 block tall with slab on the floor and torches at highest level from the floor. That seems to hold for a while, I am not sure how to test though, it seems torches are blown away by invisible entity and only at nights.